At Plant Biology 2018, the ASPB Education and Outreach booth featured a variety of resources for visitors with multiple booth guests sharing helpful teaching tools and outreach activities. Long time education committee member Scott Woody made it across the Canadian border with his FPsc (fast plants, self-compatible) and genetic resources to share with conference attendees. FPsc is a self-compatible and extensively inbred analog of the familiar Wisconsin Fast Plants (WFP) variety of rapid-cycling Brassica rapa. Working with Rick Amasino and students at the University of Wisconsin-Madison, Scott has created an integrated suite of genetic and molecular/genomic materials useful to help students make a clear connection between organismal phenotype and underlying, DNA sequence-based genotype. Education committee member Susan Bush (Trinity College) and Education Committee chair Sarah Wyatt (Ohio University) collaborated to share about conducting PCR-based labs in the classroom. Using PCR machines and gel rigs from MiniOne, they ran a genotyping experiment on red and white onions based on a paper by Sarah Wyatt (Briju & Wyatt 2005 Am Bio Teacher). Focusing on onion genes associated with anthocyanin production, they amplified DNA from the red onions, but could observe deletions (through failed PCR) in some of the white onion genes. This is a really neat project that lets students provide their own samples for class, and using the MiniOne gel system, allows students to visualize the PCR bands using their phones. Visitors were also able to enter in a raffle to win a micropipette set that MiniOne generously provided. Booth visitors also were able to view a raspberry pi demo shared by Malia Gehan, Principal Investigator at the Donald Danforth Plant Science Center, learning about how these low cost microcomputers might be used for different applications in the lab. CourseSource, an open-access journal of peer-reviewed teaching resources for undergraduate biological sciences, also was present at the education booth. CourseSource provides authors with the opportunity to publish teaching materials in a high-quality format that documents their scholarly teaching efforts, accomplishments and innovations. A key feature of CourseSource is the alignment of articles with scientific professional society developed learning goals and objectives. Senior Editorial Assistant Erin Vinson from the University of Maine was on site to answer questions that visitors might have about publishing in CourseSource and to introduce the journal to those unfamiliar with it. In collaboration with the Canadian Society of Plant Biologsts’s education committee, Let’s Talk Science shared their outreach efforts at the booth. Let’s Talk Science is a Canadian community-based program connecting educators and youth with volunteers to deliver a wide variety of meaningful STEM activities for children from age 3 through grade 12. Let’s Talk Science demonstrated some of the outreach activities that they bring to their classroom and community outreach visits. The enthusiastic volunteers pass their passion for STEM on to Canada’s future citizens and also take outreach requests from community groups, libraries, summer camps, after-school programs, and community festivals. 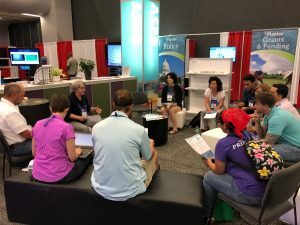 In addition to T-shirts for sale, coloring books, and the 12 Principles of Plant Biology bookmarks, a new element at the ASPB booth center this year was the Conversation Circle feature. The Conversation Circles provided a space for pre-scheduled informal meetups for visitors to learn more about various topics. This included four education and outreach Conversation Circles: All About Summer Undergraduate Research Fellowships (SURF), PlantingScience, ASPB Education and Outreach Activities, and All About CourseSource.